I'm back! 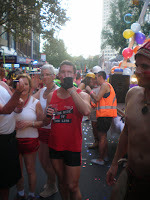 But only for a short post...if you're going to watch Mardi Gras on Saturday, look for the Gay Tradies float - I'll be the guy, in the white overalls (and nothing else), fake tan, pretending to be a painter! Yes, that's right folks, Monty is back for a second go at marching in Mardi Gras! Had so much fun last year that I couldn't say no! One very exciting thing this year is that our lovely lavender fellow former blogger Darth Gateau is here in Sydney on holidays so I get to catch up with him again! Very exciting! I know that I said that I was done with the blog, but this was a pretty momentous occasion for me - I marched in Mardi Gras this year! I never dreamed that I would do something like this, but you know, it was one of the most amazing experiences of my life!!! 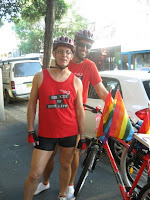 I was in the Cycle NSW float, so we weren't technically marching, but riding our bikes which was fun. But you know, the BEST moment of the day for me was a text I received from McBrad shortly before the parade began..."Good luck honey. I'm very PROUD. Love U" And then seeing him, with my friends, waving at me from a balcony overlooking Oxford St unbelievably exciting and totally awesome! What a FANTASTIC night!!! I think that I would like to leave one last thing...one of my favourite songs, of course, it's Pet Shop Boys - they continue to write the soundtrack to my life. This song sums up perfectly the last 3 years of my life since coming out. It's soooo been worth it! Well, my dear readers (all one or two of you left), I'm going to sign off here for the year. And possibly more permantly as well. As you've no doubt noted, I'm not exactly a regular blogger by anyone's standards and so it doesn't feel right to keep this blog ticking along, barely gasping for life with my irregular posts. The thing is, I just don't feel the need to blog anymore. I don't feel like I've got anything interesting to add to the blog. It started off as a bit of an experiment, on the suggestion of one of my friends who maintained a blog of his own. He thought it would be a good thing for me to do - documenting my coming out experience. And it was. And then it converted into the story of Monty's Hunt for Mr Right, which was a long and winding road, to say the least. Along the way, I met some lovely guys, some very HOT guys, some boring guys and one or two guys who I prefer not to think about. And then, out of the blue, McBrad! My gorgeous man. And so the blog changed again, following the changes in my life as "Monty and McBrad", dealing with being in a relationship. But now, over 3 years down the track, and 21 months into our relationship, with things going along swimmingly well, I feel like I've just come to the end of my blogging career. There just doesn't seem like anything worth saying that's relevant and interesting. I've been blessed with a loyal little readership who've encouraged me along the way, given me hints and suggestions when I was at a loss, cheered me through my slutty summers, and given me virtual hugs when I've been feeling bruised and lost. Thank you most sincerely. You will probably never know how much it meant to me to have your support! In particular, I'd like to say thanks to all the bloggers who I've been lucky enough to meet in person, both here in Sydney and in London! But now, it's onwards and upwards with McBrad. We're about to celebrate our second Christmas together, then head down to the beach house for a few days, and then back to Sydney in time for New Year's! I love Sydney in summer and it's a great time to be with the man you love. I hope all of you have a wonderful Christmas and a fabulous New Year! Never fear, I shall still be in the background, reading your blogs and making the odd comment, but I don't think I'll be back here in MAAM...but I shan't say never. Thanks again. Sorry it's been a few weeks since my last post but it's been rather busy! The worst aspect is that my Unwired broadband service is failing to pick up a signal and so I have no internet at home! But the move went well which I was very relieved about. My gorgeous guy McBrad of course helped me immensely - on the Friday before the move, he helped me paint my apartment which was a big thing for him...thus far in his life, he's managed to avoid having to paint by simply employing other people to do it for him. So I regard it as a mark of his love for me that he cast aside his aversion to manual labour and did a marvellous job of it!!! My friends Mack, Andy, Jacqui and Dan, as well as McBrad's friend Ted all helped on the day and although it took much much longer than we expected, we did accomplish it all. It has taken me a few big days/nights since then getting the apartment all sorted out, but it's mostly done now! I've still got all my books in boxes, however tomorrow I'm going to buy a couple of bookcases and that will the last thing! I will post some pictures soon, but that will have to wait until I've got myself a new internet account with a fixed line operator. So it's all very exciting. I do love just coming home after work to MY apartment...how good is that! And I'm getting up earlier each morning and actually having breakfast for the first time in several years! And my personal trainer Daz weighed me last night (after a two week absense from gym) and I've LOST 1.5 kgs (or 3.3 pounds) since we got back from holidays so I was very excited by that! So now, it's a matter of getting used to living there, paying off a mortgage, catching a different bus to work, and adapting to my new local supermarket. And being only 8 minutes drive from McBrad's!!! It's all good!! !